This past weekend, some Koreans enjoyed a rare 4 day weekend. People jetted off on eagerly anticipated vacations, or spent time with their families in their hometowns, leaving the streets of Seoul blissfully void of the usual hordes of people. It was easy to get a seat on the subway, cafes were quiet, and outdoor spaces, like the Han River, were peaceful and sparsely populated. We capitalized on this rare moment of stillness in the country, to head north of the city to Bukhansan National Park, and enjoy the mountains as nature intended – serene, tranquil and most importantly, uninhabited by too many other people. With 70% of Korea covered in mountains, hiking is a major weekend activity. In particular, Bukhansan National Park, with it’s easy subway access and close proximity to Seoul, sees a huge number of trekkers almost every weekend. 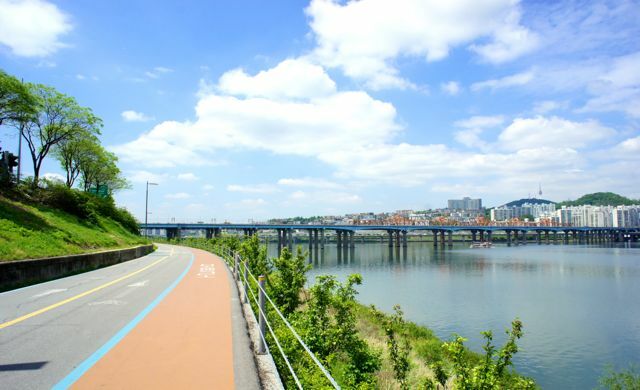 Popular trails in the mountain range can feel as busy as one of Gangnam’s streets on a Friday night. In fact, the park is so busy that it averages 5 million visitors per year and has the dubious honour of being in the Guinness Book of World Records, as the national park with the highest number of visitors per square foot! We entered the park at one of the Dulle-gil entrances, and were soon making our way upwards to Hyangnobong Peak. A sign along the way promised us that a short 2 kilometre hike would take us to the 535 metre peak. Piece of cake, right? This was one of the longest and most challenging 2 kilometre hikes I’ve ever done, and I’ve done some serious hiking. Inca Trail? Rocky Mountains? Kota Kinabalu anyone? Things started easily enough though, as we wound our way along a nicely tended dirt trail, surrounded by trees. Soon however, we were faced with a series of steep granite and stone faces to ascend. It was more like climbing, than trekking, and my quads began burning uncomfortably. I tried not to look left or right at the sheer, guardrail free precipices on either side of us and focused instead on scaling the next rocky height in front of me. After what seemed like an interminable amount of time, we rounded a corner and were rewarded with a view of Seoul’s endless urban landscape. Trying to fly. Two outta three ain’t bad. However, we’d only completed 1.3 kilometres of the trail, so onward we continued, despite the warnings of other trekkers to turn back (it was already pretty late in the day and a rainstorm was approaching). Still, how long could it take to hike the remaining 0.7 kilometres to our final destination – Hyangnobong Peak? As it turned out, a long time, with the final ascent involving scrambling up granite rock faces, sometimes using our hands or crawling upwards like Spiderman. We made it though. And it was definitely worth it. A real possibility. It happened to me. We took the subway to Yeonsinnae station, which can be accessed via subway Line 3 or Line 6. From there, we took Exit 3, rounded the corner and boarded bus 7211 to the start of the trail. Just ask the bus driver to drop you at Bukhansan. The bus ride should only take about 10 minutes. The Dulle-gil Trail is 70 kilometres long. It connects forest paths and villages along Bukhansan and Dobongsan Mountain. There are 21 parts to the trail, with each section offering hikers a different style of journey. For example, you could choose to walk the Myeongsang-gil (Path of Meditation) one weekend, and the Sonamusup-gil (Pine Tree Forest Trail) the next weekend. More information about the Dulle-gil Trails can be found: HERE. Have you been on a memorable outdoor adventure? What’s the most challenging hike you’ve ever done? Thanks! 🙂 It really was worth it. Probably the most bang for the buck I’ve ever gotten on a hike! Just 2km to get to that view, even if it was tough. I think I’d be scared to climb Korean mountains in wintertime too. Not just cuz of the cold, but because there’s lots of sheer cliff faces and no guardrails!! 😮 Good thing you didn’t trek with your fractured middle finger too! I find most of the trails involve at least a little climbing, especially at the peaks…and if I remember correctly, at the top of the Bukhansan hike, there are even ropes and things you have to use to pull yourself up to the top! Fall and spring are the best times to hike anyways! 🙂 When’s your next trip here? 70% of Korea is covered in mountains?! That seems like such a high percentage! But mountains are beautiful. I love hiking – I wish there were mountains in my area to take advantage of! It’s crazy, right? That’s why all the urban centres are so densely populated….there’s just not that much land to settle on. And also why grown in Korea fruits can be so damn expensive. I saw a box of 12 fruits here once for $145!!! I can see why the record. The majestic overview is to aim (high) for. I’ll be hiking this weekend, but I’m not looking for views as majestic as these. As always, the most challenging gives you the most rewarding experience and views. I love how close Bukhansan is to the city, although it’s no surprise to hear that it’s officially the most crowded national park. I don’t think I ever made it to Hyangnobong, but I regularly climbed up to Baegundae and Dobongsan in the colder months – hiking in summer humidity was not for me! I had slip-on cleats, which helped a lot on the icy granite surfaces, and it was so nice to be out there when it was a bit less crowded (although there would always be an ajosshi to share his soju with us!). This was one of the areas of the park that’s less crowded, so it was really enjoyable. And I do love the communal culture of hiking in Korea. I don’t think there’s a time we’ve gone, when someone hasn’t offered us some kind of food or drink!! But I do I think I’d be scared to climb in the wintertime! So slippery!! You’re brave!